Politician and former British prime minister Margaret Thatcher was born as Margaret Hilda Roberts on October 13, 1925, in Grantham, England. 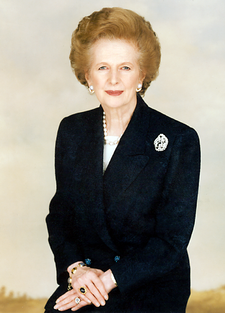 Nicknamed the «Iron Lady,» Thatcher served as the prime minister of England from 1979 to 1990. The daughter of a local businessman, she was educated at a local grammar school, Grantham Girls’ High School. Her family operated a grocery store and they all lived in an apartment above the store. In her early years, Thatcher was introduced to conservative politics by her father, who was a member of the town’s council. In 1952, Thatcher put politics aside for a time to study law. She and her husband welcomed twins Carol and Mark the next year. After completing her training, Thatcher qualified as a barrister, a type of lawyer, in 1953. But she didn’t stay away from the political arena for too long. Thatcher won a seat in the House of Commons in 1959, representing Finchley. When Conservatives returned to office in June 1970, Thatcher was appointed secretary of state for education and science, and dubbed «Thatcher, milk snatcher,» after her abolition of the universal free school milk scheme. She found her position frustrating, not because of all the bad press around her actions, but because she had difficulty getting Prime Minister Edward Heath to listen to her ideas.